“Looong gone”, but never forgotten. 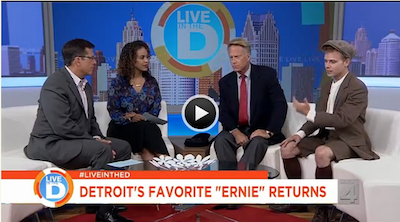 “Ernie,” Mitch Albom’s hit play dedicated to Ernie Harwell, made its world premiere at the City Theatre in Detroit on April 28th, 2011, one block from Comerica Park and just in time for fans to visit with the “Voice of Summer” once again. In real life, Harwell and Albom spoke often about doing a stage play one day. According to Harwell’s longtime friend and attorney, S. Gary Spicer, Ernie “had always hoped Mitch would author it”. Having called Harwell a friend for 25 years, Albom, the hugely successful playwright behind “Tuesdays With Morrie”, was willing to collaborate, but in 2009 Harwell’s health faded and the project had to be shelved. After Ernie’s passing, Albom picked up the pen again, and the result has thrilled over [TK]42,000 theater-goers over the past six summers. 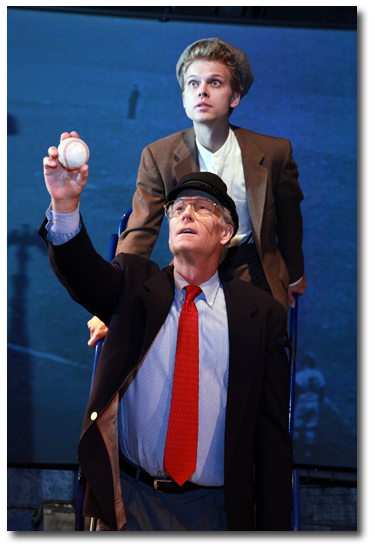 The play features actual footage from historic baseball moments, supplied courtesy of Major League Baseball, and boasts many unmistakable Harwell calls. In addition, a portion of the proceeds from “Ernie” will go to several of his most-loved charities.